Using WetWebMedia is Easy & Fun! About Asking the WWM Crew a Question, Short Vers. 1.) Ahead of writing us, use the Google Search tool linked here. Enter the key words and terms you have questions about in the white box, then press the Google Search button. By doing your own research you may quickly find the answer to your question, and much useful related input without delay! Using/choosing the "cached" view will produce highlights over your searched terms. 2.) Next, try to use the Website Index listed on the left side of the page. There are hundreds of thousands of FAQ's and articles and the answer to your question may already be on the website! 3.) Finally, if you still need assistance you can send an e-mail to the WWM Crew. Please check your grammar and spelling... as all content is answered, then posted on this website and read over MANY times by others. If you want to send attachments (particularly of photographs), please limit photo size to a few hundred Kbytes... and send along as jpegs or bmps. We have limited webmail space: NO Mega Byte size files! CELL PHONES. It is fine to inquire via cell phones. But the same above guidelines still apply! A cell phone email is NOT an excuse for poor form! 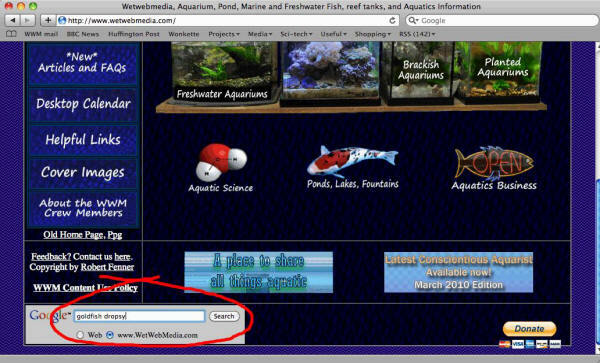 WWM is probably the most comprehensive aquarium hobby and business site on the Internet. Because of the vast amount of information here, we get something like 20-30,000 site visitors every single day, all of them looking for practical information they can rely on. There are literally thousands of articles available on WWM, with new articles being added every month. The idea of this article is to fillet the site down to its bare essentials. If you follow the steps outlined here, you'll get the most from the site in the shortest possible amount of time. You're always welcome to e-mail the crew directly, but if you have sickly fish or some other type of time-sensitive issue, then knowing your way around WWM could be a real life saver. At the bottom of most WWM pages, including the front page, there's a Google search box. There's even a Google search page on the site that does nothing other than Google searches! This is the quickest way to find information on the site. Simply enter a few search terms (i.e., words), click the WetWebMedia radio button underneath the search box, and then press the Search button. 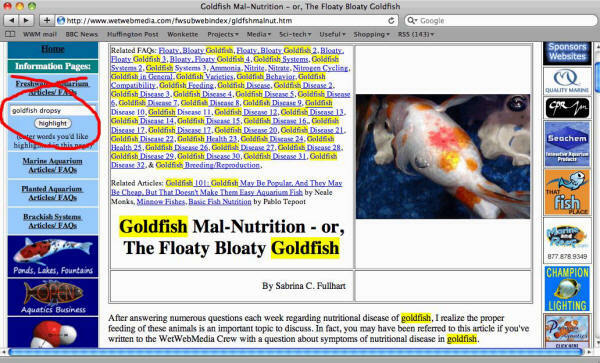 In the example shown below, the words 'goldfish' and 'dropsy' have been entered. The results of your search are ordered depending on the way Google's chooses to determine relevance. You may need to browse through them to find the article which is most useful to you. In this case, you can see that there are over 500 results including articles and FAQ pages. When you go to one of these pages, you'll see that your search terms have been automatically highlighted. This should make it easier to find out about the thing you're interested in. The terms that have been highlighted are shown in the highlight box at top right; if you want to change them to something else, you can do so there, or you can remove them altogether by deleting all the words in the highlight box and then pressing the highlight button. 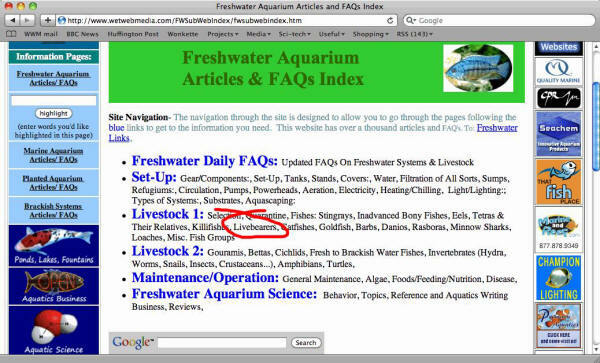 FAQ pages are distinct from articles in being records of correspondence between fishkeepers and members of the WWM crew. Whereas articles are general surveys of particular topics or issues, FAQ pages describe specific real-world incidents, so you can see the sorts of problems other aquarists have had, and what solutions crew members have proposed. By using the Google search box, you should be able to find what you need to know very quickly. 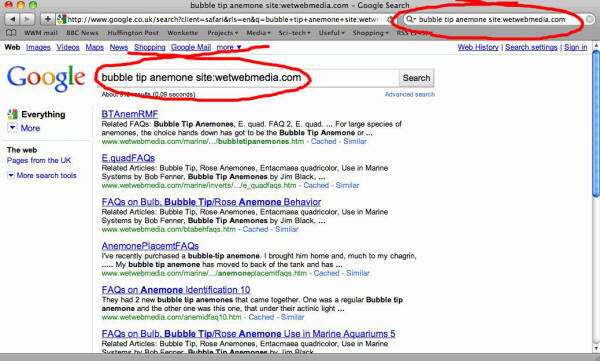 Don't forget that you can also search WetWebMedia through the Google search box in your web browser. After you've typed in your search terms, add "site:wetwebmedia.com", and then do your search. 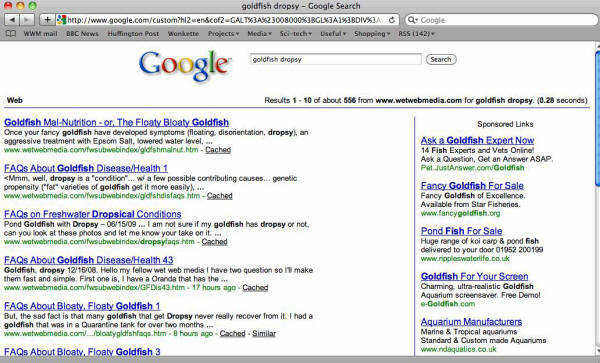 Google will now confine its results to the WetWebMedia site. You should now be able to find anything you want on WetWebMedia in seconds. No muss, no fuss! At the top of each WWM page there will be two sets of useful links, one set linking to FAQ pages, and the other to related feature articles. 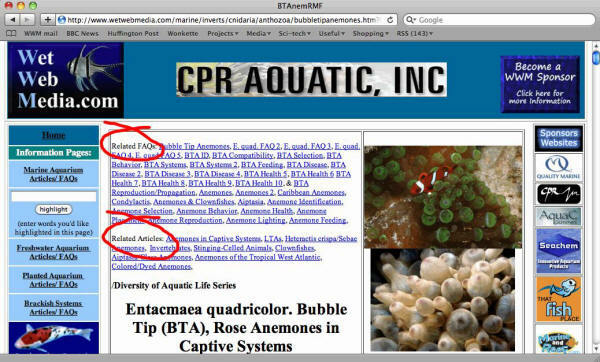 In the example shown here for bubble-tip anemones, you can see that the FAQ pages are divided up into various topics: feeding, disease, systems, compatibility, and so on. Some topics span multiple FAQ pages, higher page numbers indicating the more recently added pages. Related article links take you to feature articles rather than FAQ pages. If for example you're learning about bubble-tip anemones, then reading the articles about the basics of how to keep anemones will be useful, and you might also want to look at other species of anemone to see if they're better choices for your particular system. In short, the related article links will help you to broaden your understanding of a particular topic. If you want to browse the site, start from the front page. Click on the relevant links to go to the various parts of the site. 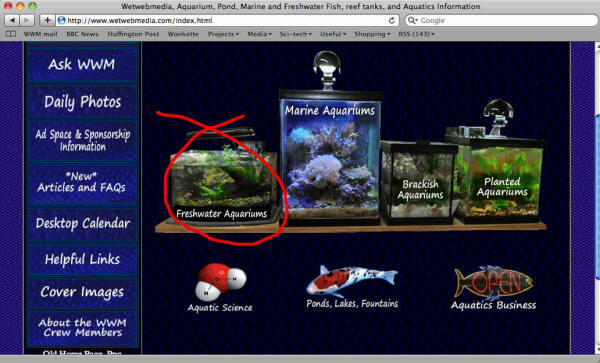 If you wanted to find out about guppies, you would start by clicking on the freshwater aquarium icon to go to the freshwater part of the site. The first page in the freshwater section is an overall index divided up into a few major categories. 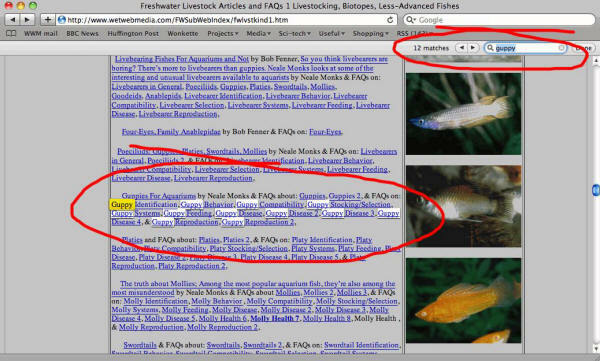 Guppies are livebearers, so in this case you'd click on the first of the two livestock categories. The livestock page contains subcategories crew members often call 'trays' into which related articles and FAQ pages are grouped. If you scroll down the livestock page, you'll get to the livebearer 'tray', and from there you'll be able to see all the various pages on guppies and their relatives. If you can't find the thing you're interested, then use the the search tool built into your browser. On Windows PCs this typically use the CTRL-F keyboard shortcut, while Macintosh users will use Command-F instead. Either way, if you search for "guppy" this way, you'll find it clearly highlighted. Browsing is a great way to learn about fishkeeping. Though you might come to the site wanting to find out about guppies, you'll find links that take you to all sorts of other topics, from aquarium maintenance through to fish breeding. 4 - It's an emergency! Very often, the quickest way to get help is to help yourself. Use the Google search tool described above to find pages that describe the questions, problems or symptoms you're dealing with. Let's say you have an angelfish that won't eat. 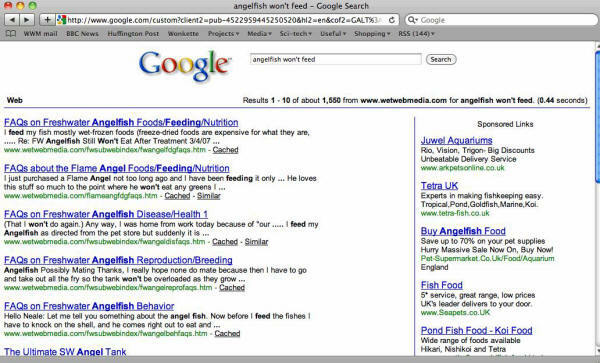 Use the search box on the front page or the special Google search page, type in some relevant search terms, such as "angelfish won't feed" and click the search button. In this case, more than a thousand pages are found, though the most relevant ones will almost certainly be near the top of the list. You could click the links to read the articles or FAQ pages, or you might decide to refine your search a bit to narrow down the results. 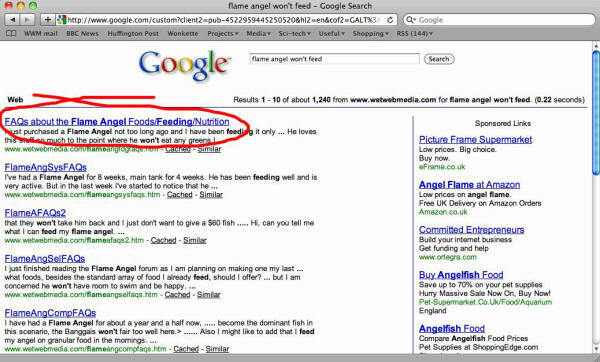 If you change the search terms to something more specific, like "flame angel won't feed", you'll find the list of pages much shorter and more relevant. In fact, the FAQ page right at the top of the results is probably the one you should start by reading. Of course you're free to e-mail the crew for help, but bear in mind that it may take some hours before we reply. If you're dealing with a really serious problem, that might be too long to wait. Make an effort to use the search tool before you write, and the chances are good you'll quickly find the relevant article or FAQ page. Dozens of people write to us every day, as you'll see from our Daily FAQ page. What those folks like about writing into WetWebMedia is that the ideas and opinions they'll get here are from aquarists at the very top of the fishkeeping game, the sorts of people who write books and magazine articles. But what do the WetWebMedia crew get out of it? They're all volunteers, so what they don't get is money! They're here to help you because they like being helpful. They enjoy the hobby, and they want you to enjoy it too. If you want to get the most from the WetWebMedia crew, remember they're volunteers, and treat them accordingly. Make a point of searching the site before writing. It's very likely that a question similar to yours has been answered more than once already. When you do write, do try and provide as much information as possible. The crew aren't psychic, and they do need to know some things before they can answer your question properly. Sure, they'll write back and ask you for more details if they need to, but it speeds the whole thing up if you volunteer that information right from the start. In other words, don't write this: "My goldfish is dying! What can I do!" Instead, write something like this: "I have a 2-year old goldfish in a 20 gallon aquarium. It's about 4 inches long and lives on its own. The aquarium has a filter and an airstone, plus some plastic plants. I change some of the water once a month. I feed him mostly flakes and occasionally some live brine shrimp. He was fine until yesterday, but now it looks like he can't swim properly and keeps rolling onto his side." In fact, you should really test your water before writing. At the bare minimum, every aquarist should have a nitrite test kit and a pH test kit, plus a thermometer. These three bits of equipment make it much easier to tell if the environment is healthy or not. Most fish disease comes down to some sort of environmental problem, so this is really, really important. So it would be sensible to add a second paragraph to your message: "The water temperature is 68 F, the pH is 6.5, and the nitrite level is 0." These bits of information point to at least one problem, a low pH, something goldfish cannot abide. It may well be that your water is too soft and acidic for goldfish, and restoring this sick goldfish to full health requires nothing more difficult that raising the hardness and pH by adding the appropriate mineral salts to the water. If your Latin is a little rusty, this phrase simply means "something for something". WetWebMedia can only work if people send us well-written messages. Why? The usual suspects: time and money! The crew are all volunteers, and have limited time to answer the questions they receive. Vague or poorly written messages take longer to deal with that ones that are written clearly and concisely. WetWebMedia stays online through advertising, and page hits depend on people finding the site through Google searches. For a search engine to catalogue a FAQ page accurately, the computer program used needs to understand it, and if the English is hopelessly mangled, that's not going to happen. So before you write to us, think about what we need to keep the site running. Don't be selfish. Does it really take that much effort to check the spellings and grammar? If you can't make that minimal effort, why should we make an effort to help you to the best of our (considerable) abilities? As stated, it's all about the quid pro quo. Hey I have a 25 gallon fresh water tank. I have 6 variety of platys and two pine apple sword tails. And a juvi either a mix withcthe blue platy nt to sure it s blue and orange. Anywayz my problem is I had a mild case of ick first time having it. Treated the tank for a week with jungle med. Still doin a smll water change everyzday I stopped using meds giving them. some almost clear both from the sword tails n platy? <Hello Sara. Could you please run your message through a spell checker? There are a lot of needless errors here, I think teenage text-speak, but whatever the case, the "currency" of this website is plain English that everyone can read, not just teenagers. So if you can make that effort, I'd be only too happy to reciprocate and help you with your problems here. >  Write to us at... an e-mail address we'll give you in a moment. >  If you're writing about a sick fish, be sure to run through out freshwater and saltwater fish health checklist. The quicker you identify the problem, the sooner you can treat your fish, and that can make the difference between life and death. >  If you're writing about a sick turtle or frog, be sure to read these articles: link A, link B. >  If you've just set up your first aquarium or pond, then your fish are probably sick because of an environmental issue, so you should check -- at the very least -- the nitrite and pH levels to make sure conditions are safe. Non-zero nitrite and ammonia levels are lethal, and sudden pH drops, especially in ponds, can severely stress fish. >  If you're planning on sending a photo, make sure no one image is bigger than around 500 KB. Larger photos mean our e-mail account fills up, bouncing back other people's messages. Make sure whatever photos you send are sharp and in focus, otherwise they're pointless. Please don't send us links to Flickr pages or YouTube videos; we don't have the time to follow such links. >  If you're after some a chat or to ruminate over some general ideas, try visiting the WWM Bulletin Board where you can talk things over with other hobbyists. We're always happy to talk to hobbyists, but sometimes we're busy answering emergencies, so our replies on less pressing issues might be short and unrewarding. > You could follow that immediately with a "pro forma" type question, outlining precisely what information we need to offer quality advice: aquarium size, ammonia/nitrite concentration, salinity, water chemistry, tankmates, etc. I just did a 25%ish water change in my 20 gallon tank and found some eggs and I'm thinking they are my cories eggs... I'm not really happy with this because me and my Mom are a little stressed out with the guppy fry. Thanks! <Jordan, there's no question within this e-mail for me to answer. 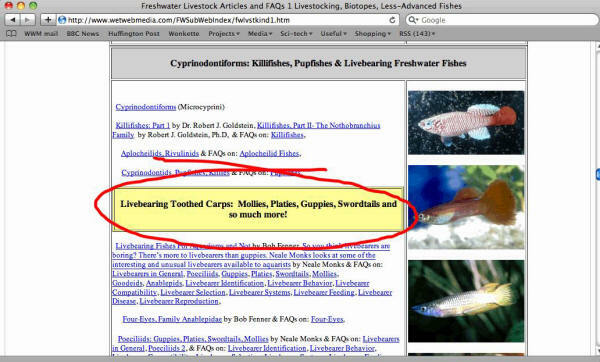 Please search WWM with "Cory reproduction" or terms like that to read more on Corydoras reproduction. I still think it would be an excellent idea for you to join the discussion board and collect/share information with others that way. Thanks. I do the usual captitaliz/sations of all scientific names (sans species), and yes, even common names (as well as proper nouns, the personal pronoun I..._). As other friends have over the years done what little we do to ensure conformity in formatting and grammar, the "spiffing up" of WWM is an ongoing task/adventure. I thank you again for your efforts. Cheers (and biers), BobF. Well that's marvelous Bob, I shall carry on as I am then! May I make the suggestion that a sentence is added to the 'Ask the WWM crew a question' page regarding capitalisations of common and scientific names of animals? I do feel that this would help a little - for me at least! Cheers, and indeed some beers as well! I have tons of questions and would like to register on your site. I can't seem to find the link to do so. Thanks. All of my fish have ich!!!!! 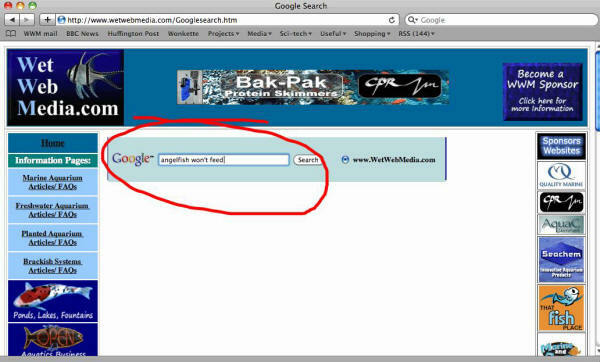 <Step 2: On the bottom left of the page, you will see a Google search bar. Charming I was looking for advice from more experienced fish keepers about my fish. Not a telling off like a 2yr old. My gosh someone recommended me to you & I have learned, learned to use a more inviting forum that will be a start. You are hilarious, maybe you should start a new career as a stand up comedian. How dare you call me "rude" that's one thing I am not. I never questioned your experience, & was more then satisfied with your advice/suggestion. I would also like to point out I may have not come up against fading pigmentation in goldfish before, hence why I wanted advice. But I do have comets & koi carp between 9-13years old in a my pond, not one of them has died or been sick & sick fish is what I do not have experience in. I am finished with any type of forum. I will keep doing what I do, there must be one reason why none of my fish have died as yet, my love & care for them. From now till the end of time I will learn my way, from first hand experience. Corrected letter on gaimard Coris >No problem, here is the corrected letter. Nobody has mentioned it previously, but now that I know I'll make sure to keep with proper grammar rules. Sorry about the inconvenience. >>Hey, we *really* appreciate the effort, my friend, though most are too busy to even bother asking. However, they also are generally not the ones who'll spend the time retyping, and then it's left to those (usually Bob, and when he's overseas, me) who are putting the queries up on the daily page to correct. It's often too much to accomplish in a reasonable time frame. A lot of people get mad when we ask. It's not up on the main daily page, the requests are found through another link, and it's understandable that folks miss it. I, for one, VERY much appreciate your understanding on the matter. Anyway, let's get going answering your question!